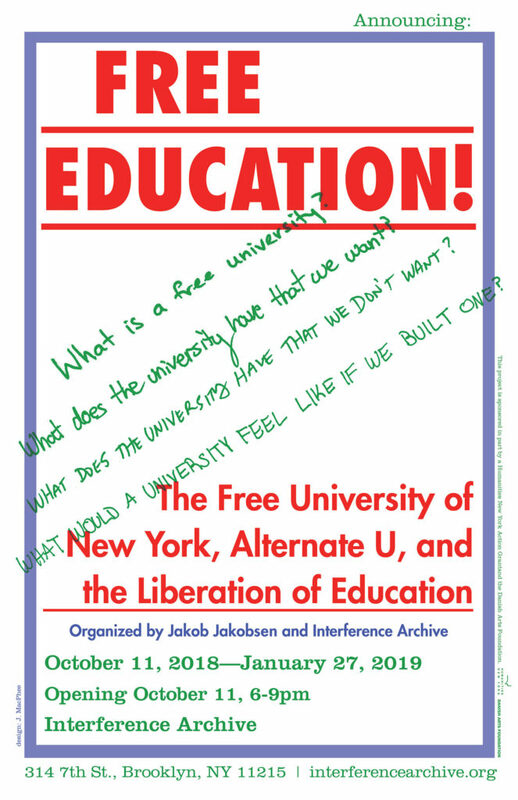 In the tradition of our exhibition publications at Interference Archive, the publication for Free Education! will exist more as a set of resources that can live beyond the exhibition, and that can be useful to those who are not able to visit the exhibition in person. Created in the do-it-yourself style of much of Free University’s output, using the risograph shared by Interference Archive’s coworking community, this publication will include reproductions of archival material used in the exhibition alongside curatorial text and transcription of interviews with FUNY participants. Free Education! offers high school- and college-level classes the opportunity to visit the exhibition. Courses or organizing groups focused on education, collective work, and alternative community spaces will find this exhibition especially relevant. This project is sponsored by a Humanities New York Action Grant. Any views expressed in this exhibition do not necessarily represent those of the National Endowment for the Humanities.